This is my 100th post so I wanted to make it a good one! I thought I should feature something fantastic or share something special. Whilst rummaging around in my “stash” for inspiration, I realised the answer was staring me in the face... 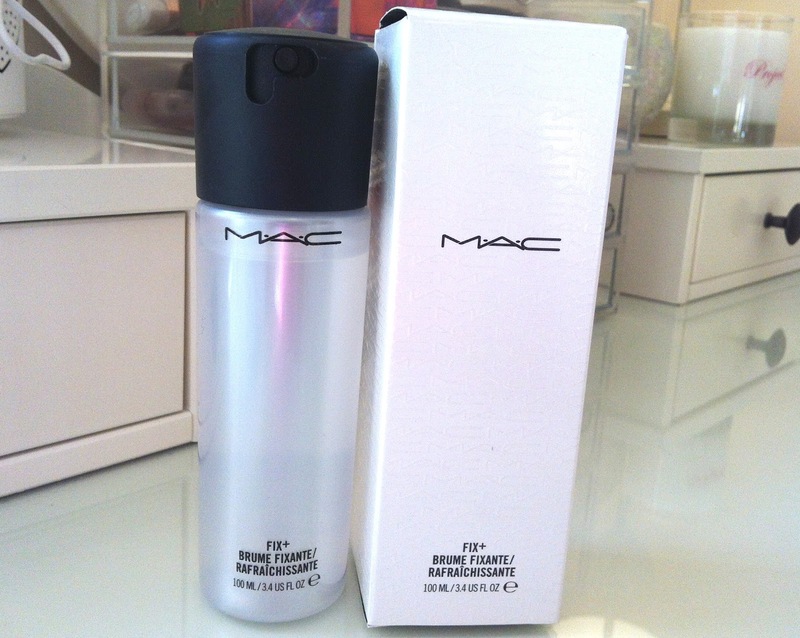 Sitting there in its prime location on my dressing table screaming “pick me, pick me” was my bottle of MAC Fix +. I can’t believe I’ve never featured this on my blog. It’s one of my absolute favourite products. It’s my “I’m feeling bad about myself” solution and 8 hours sleep cheat. I must admit I first bought it on the back of beauty blogger hype. Normally I recommend trying the product for yourself first – what works for others doesn’t necessarily work for you, but this was something I knew I had to try (even though I didn’t know what it actually was or how to use it ). Armed with my scepticism I ordered it online and it was a case of love at first spritz! Set – Don’t ask me how but a spritz of fix plus will set your face a treat. I know it doesn’t make sense, you’d think the water would wash away your make up, especially mascara, but not Fix +. When I first used it I was fully expecting to get Alice Cooper eyes, but my mascara didn’t run or smudge. 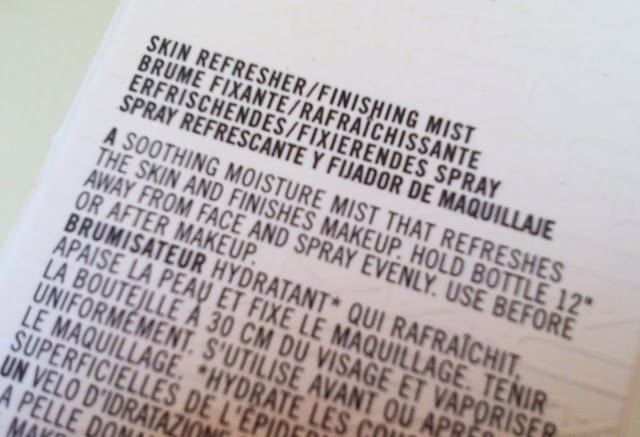 Holding the bottle 12 inches from the face, spray evenly after makeup application (and before if you like) – I find one of two pumps is sufficient. The mist is so fine and dries quickly but some people swear by setting it further with a hairdryer. It gives the face a dewy glow and make up looks more vivid, more done. It’s my life saver when I’m tired or hungover and need a little extra help. Refresh – This is what I use it the most for. Say you’ve been at work all day. You’re going out but don’t have time to take your face off and start again... a spritz of this will freshen you right up, magically bringing your make up back to life. It moisturises tired and thirsty skin and gives you back that glow. You can add a bit more blusher, concealer, whatever you need and spritz again to set. The mist is so fine it doesn’t soak the face and takes just seconds to dry. Shine – It can be used to apply eye shadows and pigments. It’s especially good for sparkly one. Spray the brush first to damped, dip into the product then apply to the face/eye wet. It makes colours much more vivid and shiny and longer-lasting. It's difficult to show in a picture the true result as they're quite subtle. I'm wearing it in this picture I took to show my Benefit Coralista blusher. I think you can see the all-over glow, especially on the cheeks and forehead... excuse my slightly burnt and very shiny nose. Fix + comes in two sizes 30ml costs £7 and 100ml £12.50. The 30ml bottle is really very small, more of a travel size. 100ml is what I have and is much better value. I agree it’s pretty insane spending £12.50 on a small bottle of water, but I’ve had this one since February and there’s barely a fifth gone... and on those tired, sleepy, face-still-not-woken up days, it’s priceless! I'm tempted to get this for my prom on friday. I love Fix+ too! I went without it and realise how much it actually makes a difference as a finishing touch :) definitely my fix everytime!! Great isn't it. It's one of those products you've got to use yourself to understand the difference it makes. I'm a US reader that's been hooked on your blog ever since you discussed the best foundations for dewy skin (and thank you for that, by the way!!) and I just bought M.A.C. 's studio sculpt foundation on your recommendation. While I was there, I picked up some of this as well, also on your recommendation - you are so, so right about both! Got tons of compliments on my makeup last night. Keep up the fantastic blogging! P.S. - subscribed to U.S. Glossybox too, am eagerly awaiting the arrival of my first box. Thanks for the encouragement Paige. I've been very busy lately with work and and holiday but hope to have lots of new material on here soon. I still love studio sculpt foundation, one of my all time faves. Glad you liked Fix+ too. Fix + can alsobe used on hair! I spray it on towel dried hair before blow drying & it gives a really soft yet volumised result. It really is amazing on hair. I've just bought this, it's so refreshing I agree!